The trigeminal nerve is the fifth cranial nerve and it is responsible for sensation and motor function in the face and mouth. The sensory function of the trigeminal nerve is to provide tactile, motion, position, and pain sensations for the face and mouth; its motor function activates the muscles of the jaw, mouth, and inner ear. The trigeminal nerve has three major branches on each side—the opthalmic nerve, maxillary nerve, and mandibular nerve—that converge on the trigeminal ganglion. The trigeminal ganglion is analogous to the dorsal root ganglia of the spinal cord, which contain the cell bodies of incoming sensory fibers from the rest of the body. trigeminal ganglion: The trigeminal ganglion (also called the Gasserian ganglion, semilunar ganglion, or Gasser’s ganglion) is a sensory ganglion of the trigeminal nerve (cranial nerve V) that occupies a cavity (Meckel’s cave) in the dura mater, covering the trigeminal impression near the apex of the petrous part of the temporal bone. The trigeminal nerve (cranial nerve V), and it contains both sensory and motor fibers. It is responsible for sensation in the face and certain motor functions such as biting, chewing, and swallowing. Trigeminal nerve: Schematic illustration of the trigeminal nerve (labeled Sensory root above) and the structures it innervates in the face and mouth. The sensory function of the trigeminal nerve is to provide the tactile, motion, position, and pain sensations of the face and mouth. The motor function activates the muscles of the jaw, mouth, and inner ear. The trigeminal nerve is the largest of the cranial nerves. Its name, trigeminal, means three twins. It is derived from the fact that each nerve, one on each side of the pons, has three major branches: the ophthalmic nerve (V1 in the illustration below), the maxillary nerve (V2), and the mandibular nerve (V3). The three branches converge on the trigeminal ganglion that is located within the trigeminal cave in the brain; it contains the cell bodies of incoming sensory nerve fibers. The trigeminal ganglion is analogous to the dorsal root ganglia of the spinal cord, which contain the cell bodies of incoming sensory fibers from the rest of the body. 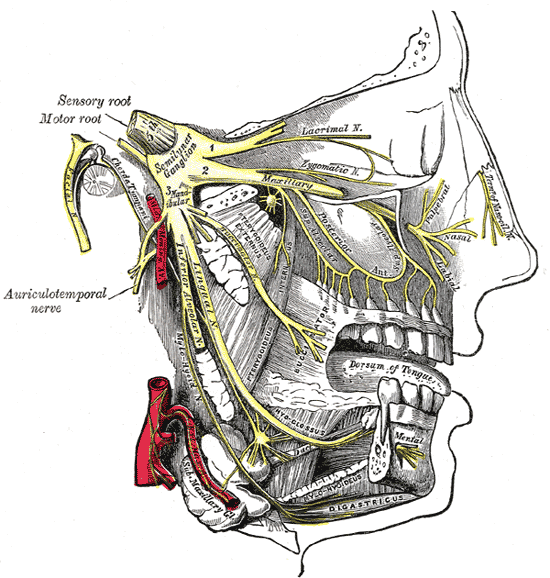 Areas of the face innervated by the trigeminal nerve: The ophthalmic nerve branch (V1) innervates the bright red area, the maxillary nerve branch (V2) innervates the light red area, and the mandibular nerve branch (V3) innervates the yellow area. Motor fibers pass through the trigeminal ganglion on their way to peripheral muscles, but their cell bodies are located in the nucleus of the trigeminal nerve, deep within the pons. The sensory function of the trigeminal nerve is to provide tactile, proprioceptive, and nociceptive afferents to the face and mouth. The motor component of the mandibular division (V3) of the trigeminal nerve controls the movement of eight muscles, including the four muscles of mastication: the masseter, the temporal, and the medial and lateral pterygoids. The other four muscles are the tensor veli palatini, the mylohyoid, the anterior belly of the digastric, and the tensor tympani. With the exception of the tensor tympani, all of these muscles are involved in biting, chewing and swallowing, and all have bilateral cortical representation.